With competition beginning, we may need to speed up some of these previews! Otherwise I could look silly predicting something that already happened, and getting it wrong.. So today, we’ll cover throws and Multi events. Links to parts 1, 2, 3, 4, 5. D efending Shot Put champion Adam Nelson (21.47 SB) will have a battle on his hands, primarily with his American team-mate Reese Hoffa, the reigning World Indoor champion, who threw a career best and world-leading 22.43m in London. 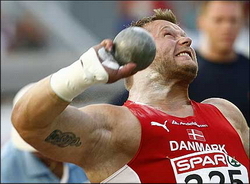 Olympic bronze medallist Joachim Olsen (Denmark) continues to improve, most recently he improved his national record to 21.61. Gerd Kanter (Estonia) is the world leader (72.02 from early May), but few can deny that the overwhelming Discus Throw favourite in Osaka will be Lithuanian Virgilijus Alekna. The two-time World and Olympic champion currently boasts the longest winning streak in the sport at 37 finals. He’s thrown beyond 70m four times this season, including a 71.56 season’s best. The big man of Japanese sport, Koji Murofushi again dominated the National Athletics titles, winning the Men’s Hammer title for a record 13th straight year at Osaka’s Nagai Stadium with a throw of 79.24m (260 feet). The win broke the tie he had set with his father Shigenobu, who had won 12 national titles! 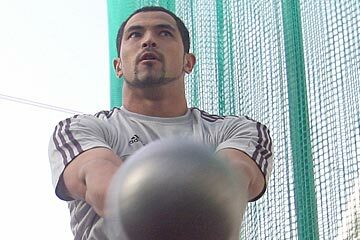 Murofushi had delayed starting his national season due to completing his doctoral thesis on biomechanics of the hammerthrow, at Chuo University. Last week he achieved completion, and (the soon-to-be) Doctor stated that he would be ready for the World Championships – which he qualifies for with an ‘A standard’ performance at this National Titles.